There is a little speck on the end of the island near the rainbow. That is HFC David, looking at a sandwich tern, which I did not get a picture of. There were a ton of redstarts all over the island. This is a male. This is a female redstart. They both do this little fan dance with their tail feathers to stir up bugs to eat. 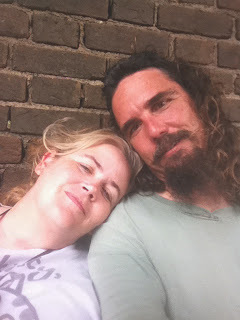 Me and David, during one of the rain delays, inside the fort. Some of the arches in the fort. David, Larry, and some other birders we ran into on the island. 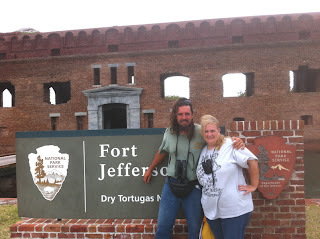 We spent some time going through the museum in the fort. This was their coral display. Male black-throated blue warbler. This was a lifer. I don't remember who this was. Ovenbird, another lifer for me. A grasshopper sparrow being eaten by a cattle egret. Ironically, the dead grasshopper sparrow was a life bird for me. Me and David outside the fort. We took this same picture on our honeymoon, 7 years ago. Another antilean night hawk, also napping. A conch shell on the beach. A cattle egret, getting a drink. We saw a cattle egret drop dead right in front of us, from exhaustion. It was pretty sad, but a fact of life on the island. Can't remember who this is. Worm-eating warbler. Another lifer for me. This was weird - a leukistic hooded warbler. Hooded warbler is a lifer for me. I doubt I'll ever see a partly albino one ever again. Male cape may warbler, another one of my favorites of the weekend, and also a lifer. Merlin. Not a lifer, but the first decent shot I've taken of one. Back on the boat. Our cabin. David, looking out at the island. Of course the skies cleared as we neared home. But actually, the weather is one of the reasons we had so many birds, so it was a trade off. All in all it was a great trip, and one that I was very glad I GOMB for! Hope you join us on a future (more local) walk soon. Remember you can see stuff like this on the internet, but you can only experience it if you GOYB! 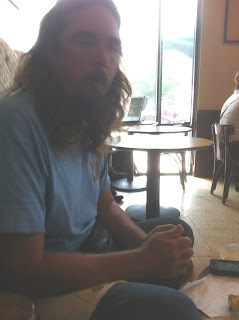 We started out the trip with the traditional stop at Starbucks for fuel. 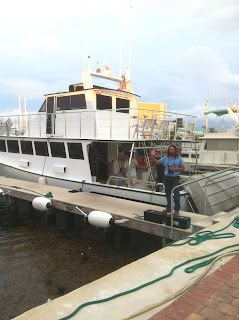 After much driving around in circles, we finally found the boat. Here is David in front of it. Before the boat left the doc, we went out to dinner with Larry and a few other folks from the boat. 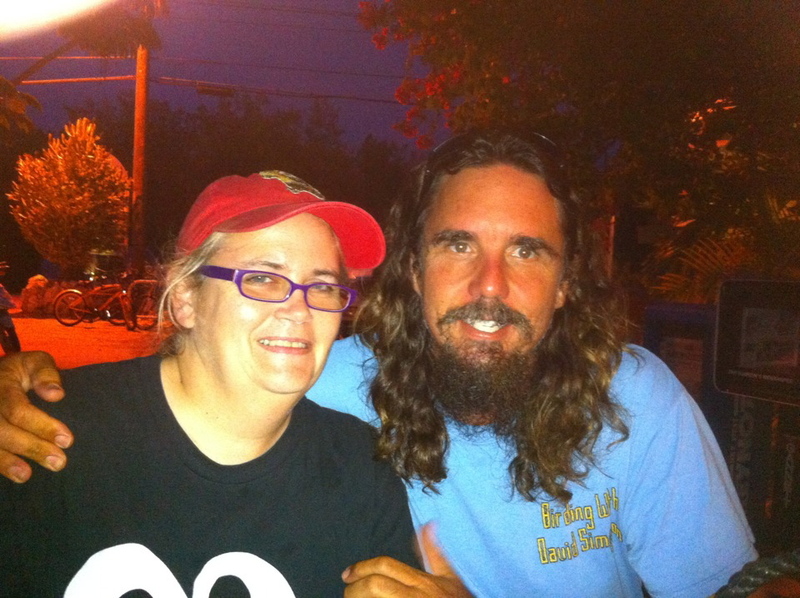 This is us at the Hogfish restaurant. Really yummy seared tuna. This was the first critter I saw, a big dolphin playing in front of the boat. There were some pretty big waves, and I really didn't want to barf my first day on the boat, so I took a nap for a while after I took this picture. We made it to the Dry Tortugas National park, shown here behind a bunch of brown boobies. There were lots of warblers on the island. Shown here is a female cape may warbler. This was a lifer for me. Tennessee warbler, also a lifer for me. Palm warbler, looking all fluffy. Female black-throated blue warbler. Another lifer for me. One of my favorite warblers, the common yellowthroat. I thought I had gotten a picture of two frigate birds mating. David pointed out to me that it is in fact one frigate bird, apparently mating with his own wing. The water is just an unbelievable color there. Rock pigeons. Notice that one of them is chewing with his mouth open. Ew. Another one of my favorite warblers, the northern parula. Some lacy coral that was on the beach. My favorite critter of the weekend, a hermit crab. He just has such a happy little face. An antilean nighthawk, taking a nap. This was a lifer for me. Magnolia warbler, another lifer for me. Rose-breasted grossbeak, another lifer for me. The Dry Tortugas are really the main resting stop between here and Cuba. Many birds don't make it and many who do are weak and easy prey. This was a shore bird of some kind who was predated by something. There was a blue grossbeak (forefront) hanging out with an indigo bunting. I like this picture cause it shows how despite both being blue, they aren't even close to being in the same color palette. A close up of the blue grossbeak. This was kind of a weird looking white winged dove, with a blue face. That was the last bird we saw on day 1 on the island. After birding we returned to the boat for noms and much needed sleep.